A tribute to Aphrodite's birth place. According to the Greek Mythology, the island took its name from the first Inhabitant's name, "Milos", but terminologicaly it is more likely to derive from the ancient word "Vilos" which meant sheep. The well known statue of Aphrodite was found in Milos in 1820 and is nowdays exhibited in the Louvre museum. A replica of the statue is exchibited in the archaeological museum of Milos, in Plaka. Milos is famous for having more than 75 beautiful beaches with crystal clear water. Due to its volcanic nature there is a wide variety of different landscapes and morphology. This is why you can find beaches with white sand, golden sand, rocks, stones in various colours and various other minerals. There are organized beaches and isolated ones, each one with different colours, different sea depth and different composition. Feel free to explore them all with a car rental from Tourlakis cars! Milos is the 5th largest island of Cyclades with 5.000 inhabitants. 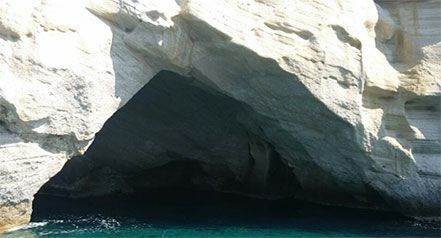 Kleftiko beach is actually a complex of undersea caves that are accessed only by sea. This means you can visit the place only by using a boat. Fortunately there are everyday itineraries for Kleftiko beach. If you decide to take the tour of the island by boat keep in mind that depending on the boat it takes from a few hours of travel up to travelling all day long. Of course there are stops to other interesting beaches and places, so it is guaranteed that you will enjoy it. Here is our opinion about the necessity of a car rental in Milos. According to our experience, as local residents of Milos and opinions from tourists that have visited our island all these years, a car rental is a "must" for any visitor in Milos. Although the public bus network is fairly good, it still does not cover all the possible places of interest not to mention it is not a 24/7 service. Furthermore pricing is much cheaper when you rent a vehicle especially when you are 4 people and visit 2-3 places per day. So, money wise and comfort wise it is the best option for your vacation.